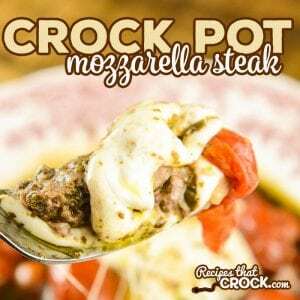 Crock Pot Mozzarella Steak - Recipes That Crock! Are you looking for round steak crock pot recipes? Our Crock Pot Mozzarella Steak is an easy way to make a delicious low carb family dinner that even carb lovers enjoy! I love when we have a slow cooker recipe that brings different flavors to the table than what people expect from crock pot. Our Crock Pot Mozzarella Steak was inspired by a recipe found in one of our favorite low carb cookbooks: The Everyday Low Carb Slow Cooker Cookbook. We loved making this dish in our Instant Pot Gem Multi-Cooker (Note: NOT a Pressure Cooker) while preparing our dinner in our Camper Kitchen. Our IP Gem tends to cook a little bit “cooler” than a lot of our other slow cookers — it still cooks great– but it tends to not overcook things as much as some of my other slow cookers, so I like using it for those days when we need to be away. Just perfect for our camper kitchen or any kitchen where you need to be away ;). Pour half of your pesto into the bottom of a 6 quart slow cooker. Place steaks down into pesto, moving them around to cover them in the sauce. Add salt and pepper, onion and garlic. Add tomatoes and remaining pesto. 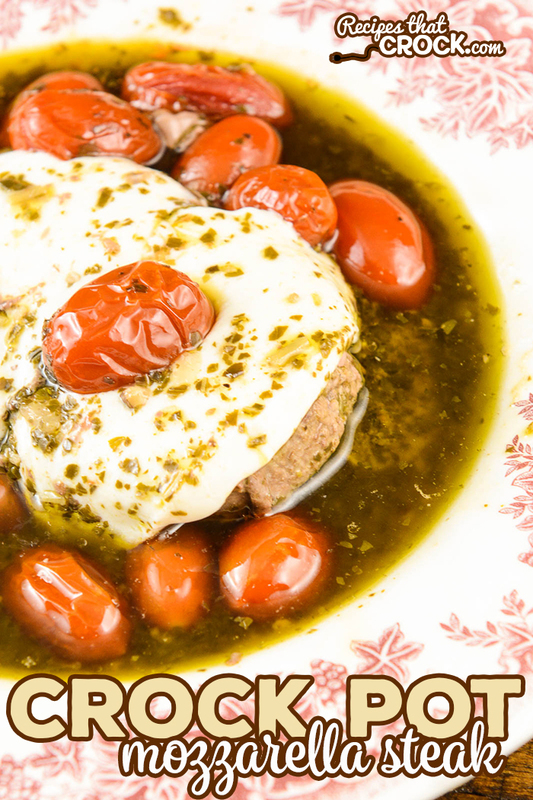 Our Crock Pot Mozzarella Steak was inspired by a recipe found in one of our favorite low carb cookbooks: The Everyday Low Carb Slow Cooker Cookbook. what pesto????? I missed where the making of this was explained????? Hi TJ- You can purchase pesto pre-made at the grocery store near the spaghetti sauce. If you would prefer to make homemade, we do have a recipe on our sister site that you may want to try: https://www.goodenessgracious.com/easy-peasy-pesto.html Hope that helps.